"Newlyweds Molly and David are only sixteen and eighteen years old when they head west to the unclaimed land there. But they work hard, and at first their new life is full of promise: the wheat is high, their dugout is warm and cozy, and a new baby is born to share their happiness. Then disaster strikes, and David must go east for the winter to find work. Molly is left alone with the baby - with nothing but her own courage to face the harsh prairie winter." When I read it as a teen I was thinking how romantic it was to set of west with the love of your life at sixteen years old. My thirty three year old self picked it back off the shelf shortly after the holidays to give it a re-read. At a mere 118 pages, this is a quick read and I pleasantly filled up one of the children's nap times reading it. It is a pleasant read, but this time I looked upon it a bit differently. Marriage is hard work. It isn't easy and it isn't always fun. You must learn to put Self to death and think about another person and your combined goals and dreams. (Let's be honest - putting Self to death can be perfect agony at times.) Add children to the mix and your life is totally not your own (and you wonder why you ever thought it was to begin with!) When life pushes in, it's hard to learn how to push back - together. It can be learned. It must be learned. But it is a hard lesson to learn, at that. 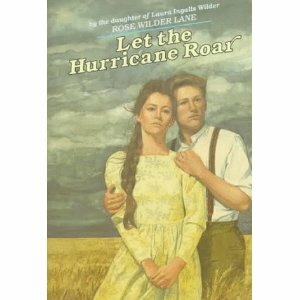 I rather like Let the Hurricane Roar though because the book begins with the marriage and allows you to get to know the couple. If I were to hand over a book about a fictional relationship to my daughter when she became a teen, this would probably be the book. Molly and David's relationship is not necessarily realistic to the modern audience - (only because you do not seen many people working to exhibit the traits that Molly and David exhibited these days) - but it is ideal (and, quite frankly, it is attainable.) This story presents a relationship that gives one something to aspire to. A woman deciding that she is going to be a help-meet to her husband, no matter the personal cost, is something to admire and learn from. In this book Molly is called upon to sacrifice a great deal: family, security, and possible food and shelter. She sacrifices these things for the sake and privilege of being David's help-meet. She is fearful and afraid at times but she acts out of love and respect in a very Biblical way which I can truly appreciate. David is supposed to be the head of his family, caring and providing for Molly and their young son. He is to love her and listen to her. He does both, in a very realistic way, I think. He faces great challenges and discouragement. When he first marries her, he is full of optimism as they head west. Then real life smacks him in the face and the full weight of his new responsibilities come crashing down on his head and he struggles with this in the book. Again, I think this is very realistic. Rose Wilder Lane creates a female that females can identify with. Molly wants to be strong, but she knows she must put aside her fears and support her husband no matter what her emotions may be telling her to do. David wants to provide for and love Molly but it turns out to involve a lot more hard work than he was originally expecting. They both start out young and optimistic when reality crashes in on them. But Molly and David survive. Which again gives us, as the readers, something to be encouraged by and aspire to. All of the above is almost ironic considering the fact that Lane's marriage did not survive the challenges which life threw at it. I'm not aware of all of the particular details of why her marriage failed to survive, but you can get an idea of why on the Wikipedia page about Rose Wilder Lane. I half wonder at how she could write Let the Hurricane Roar at all but then I think of Montgomery's writings which are filled with happiness and light despite the fact that Montgomery was personally depressed. These female authors were able to write truth even though they did not personally experience it as applied to their own life situations. Marriage is not easy (and this book testifies to the fact) but it is a very blessed state (which, again, this book clearly states.) If the modern day audience could even begin to grasp the idea that hard work is good and profitable then we might start seeing a decline in the divorce rate, which would be a praiseworthy thing to take note of indeed! One book I'd hand over not just for entertainment purposes but to show the modern reader how marriage can be done is Let the Hurricane Roar . I highly recommend it. In my opinion, the story is a valuable one and a most worthy read. Sounds like another to add to my list. I've always wanted to read Rose's books given as she is one of my favorite couple's daughter. Have you read The Five Love Languages by Gary Chapman? As I started reading your review, I thought, "Wow, I'm surprised this came from Rose." I can't remember if I read any of her books, but I did read a biography of her and was disappointed that her views were so different from her mother's. But evidently she did see enough of a good marriage somewhere to be able to chronicle it. I thought, the last time I read LIW's The Long Winter, that I don't know if modern folks could survive a situation like that. Not only are we used to all our conveniences, but people haven't been trained to stick anything out. This book sounds like it evoked similar thoughts. Well, sounds like it could be pretty good...especially if it's remotely romance-y yet still Carrie-approved. hahaha! On the hard work thing...Amen sister! Very interesting to get your thoughts on this. I got the impression from 'Becoming Laura Ingalls Wilder' that Rose basically stole her mother's experience and wrote it into this book before LIW had completed her series of books. It kind of biased me against it, but you make it sound intriguing in its own right! I'm going to try to find this one. I recently read Zochert's biography of Laura Ingalls Wilder. And, depending on the assumptions you make, the divorce rate actually peaked 20-30 years ago, around 1981 to 1990. Your post inspired me to read this book. I'm pretty sure now that I had read it sometime in the distant past. Some books don't change too much if you read them both as a child and as an adult...this one isn't one of those! Thanks for bringing it back to mind. I've never read this book. I wonder if both women were able to write outside their personal experiences because that's what they longed for.